The Roemahkita Poll Merino is an easy care uncomplicated and true dual purpose meat and wool animal. Over the last few years we have placed an emphasis on wool that is very soft, deep bold crimping, lustrous and white that has a good micron and a high comfort factor. We are very happy with the results we have achieved so far—have a look and feel for yourself! In January 2017 we OFDA tested 298 ram lambs. Avergae Micron 18.0, SD 2.8, CV 15.9, CF% 99.8. In January 2016 we OFDA tested 225 ram lambs. Avergae Micron 17.8, SD 2.9, CV 16.4, CF% 99.89. In January 2015 we OFDA tested 210 ram lambs. Average Micron 17.0, SD 2.7, CV 15.9, CF% 99.96. In February 2014 we OFDA tested 225 ram lambs. Average Micron 17.2, SD 3.0, CV 17.0, CF% 99.6. In January 2013 we OFDA tested 260 ram lambs. Average Micron 18.5, SD 3.0, CV 16.0, CF% 99.6. In January 2012 we OFDA tested 280 ram lambs. Average Micron 18.3, SD 2.8, CV 15.0, CF% 99.8. In February 2011 we OFDA tested 238 ram lambs. Average Micron 18.6 SD 2.9 CV 16.0, CF% 99.8. In February 2010 we OFDA tested 219 ram lambs. Average Micron 17.9, SD 2.8, CV 15.9, CF% 99.8. In February 2009 we OFDA tested 198 ram lambs. Average Micron 18.4, SD 2.9, CV 15.7, CF% 99.8. In January 2008 we OFDA tested 228 ram lambs. Average Micron 18.7, SD 2.9, CV 15.6, CF% 99.7. In January 2007 we OFDA tested 240 ram lambs. Average Micron 17.6 SD 3.0, CV 16.5, CF% 99.8. February 2006 we OFDA tested and shore 270 ram lambs. Average Micron 19.2, SD 3.2, CV 16.7, CF% 99.5. 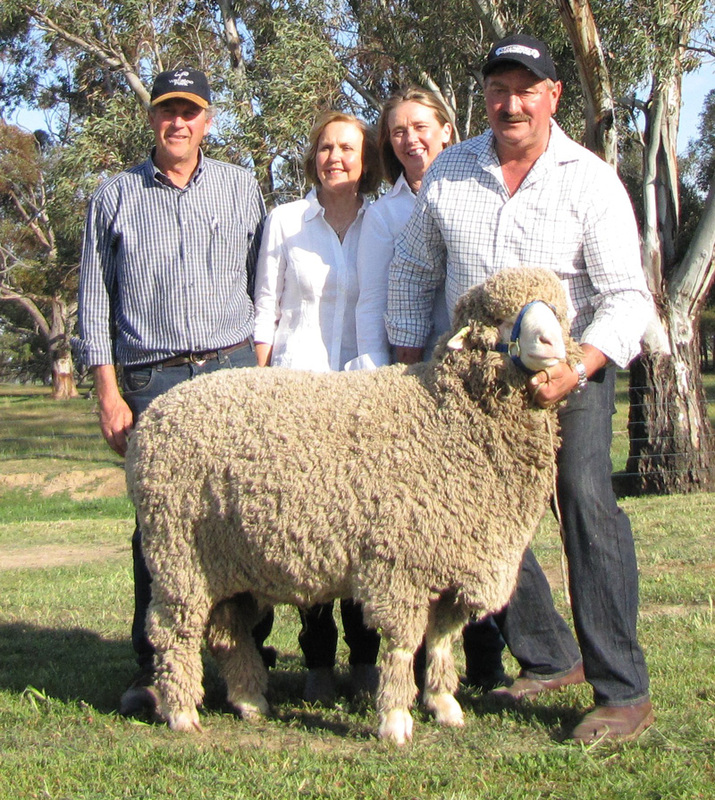 We are noted for big, plain bodied, early maturing poll merino sheep. The average body weight of our young rams at our on Property auction have ranged from 87—92 kg for mainly 15 month old rams, over the last 5 years. We are striving and achieving improved body weights. November, 2004 we sold to Tumby Bay Butcher, 7 month old cull poll merino lambs, at an average of 25 kg per carcass at $3 per kilo ($75 per head). Our Field Day team for March, at 10 months, averaged 76 kgs. 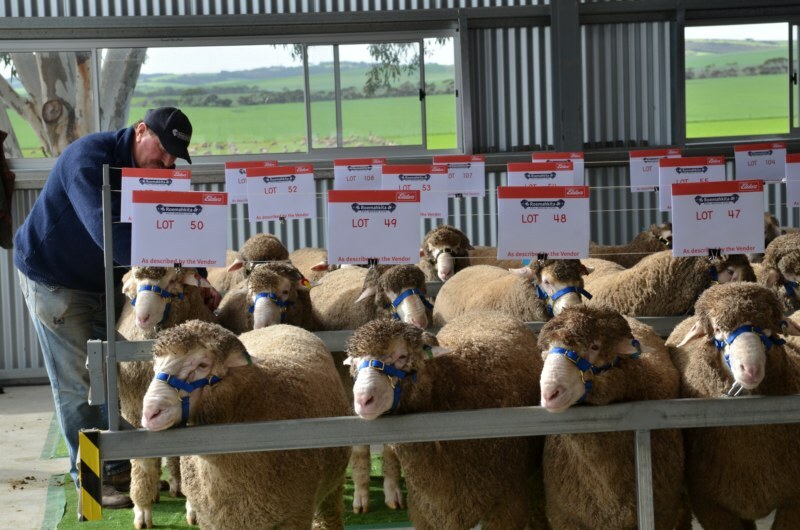 We have joined the Merino Validation Project, (now Sheep Genetics Australia/SGA) to measure body weights, growth rates, eye muscle depth, fat depth, meat & wool traits. We look forward to being able to compare our sheep to other merino and meat sheep breeds throughout Australia, on the National Database of SGA. We hope this will further help and improve the economic benefits of our good carcass traits. June 3 2005, 2 cull ram lambs were taken to the Cummins Meat Store, and they dressed 49 & 51.5 kg, at just over 13 months of age. Comment from Cummins Butcher, David Barnes, was that our hogget's were by far the biggest hogget’s he has ever killed and they still had their lambs teeth. Sheep are assessed on their skin thickness/softness and presence of wrinkle, and scored with a rating of 1-5. The ewes have been identified and we will carefully monitor and watch with interest, future breeding and production results. We are of the belief skin score 1 and 2 easy care sheep will produce more wool of better quality, longer staple length, more lambs, less culls and more profit. At Roemahkita we continue to aim for the big plain bodied, uncomplicated, easy care, calm, fertile and alert sheep, with a strong constitution that will thrive and survive in all environments. We aim to improve our lambing percentages, to around 120% lambs weaned over the next 5 years. In 2003, 2004, 2005, 2006 & 2007 we identified all 4 and some 6 teat ewe and ram lambs. These ewes have proven to have better milking ability and higher lambing percentages; in a trial within Pastoral country, NSW. For the last five years we have pregnancy tested all ewes; those empty have been joined again. Ewes not pregnant after the 2nd joining are then culled and sold. We stringently class rams and ewes by assessing correct and robust body structure, good conformation and quality wool; using measurements to aid our selections. Emphasis is placed on good fibre density and staple length, very soft handling, deep bold crimping, lustrous white wool of a good micron and high comfort factor.